The trail doesn’t have a name. It shouldn’t. It isn’t even really a trail. It’s a climb, a two-track that mangles skid plates and tests a 4×4’s traction, wheel travel, and ground clearance. We just call it “the Hill.” For most of its quarter-mile length, it holds a steady angle of 40 degrees or so, which is no big deal. But about 25 feet from the top, it gets nasty, kicking up sharply just as the surface changes from grippy hard-packed dirt to slippery rock. Deep ruts grab the left-side tires and throw a truck back and forth across the slick surface, arresting its momentum just 10 feet from a stupid-steep breakover that high-centers all but the tallest rigs. 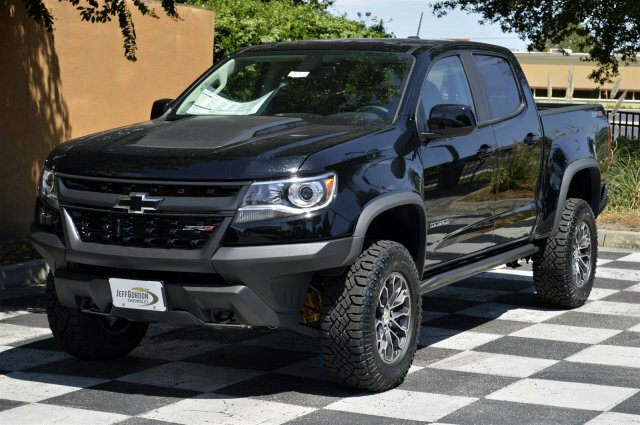 Add Chevrolet’s Colorado ZR2 Bison to the list. With its front and rear differentials locked and its armored undercarriage scraping along the jagged rock shelf, Chevy’s most capable off-roader made the climb look easy. AEV built about 700 of them from 2002 to 2017, and some, including us, say the Brute was the inspiration for the new Jeep Gladiator. Work on the Bison began about two years ago, soon after Chevy unveiled the Colorado ZR2. Beefy stamped-steel front and rear bumpers and five hot-stamped boron-steel skid plates are at the heart of the Bison package. Shielding the pickup’s oil pan, fuel tank, transfer case, and its locking front and rear differentials, the new skid plates are stronger and more extensive than the ZR2’s aluminum units. With the Chevy properly caked in Burns Canyon’s famous red clay, we landed in Pioneertown, a western movie set founded, in part, by Roy Rogers and Gene Autry in 1946. Its old-timey wooden facades have appeared in over 50 films and television shows, but the live music, quality rustic cuisine, and cold beer at Pappy & Harriet’s Pioneertown Palace have been bringing in tourists and off-road enthusiasts since 1982. Naturally, we ordered a couple of bison burgers.